You are going to Watch Cardcaptor Sakura Episode 50 English dubbed online free episodes with HQ / high quality. 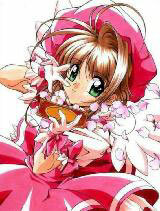 Stream Anime Cardcaptor Sakura Episode 50 Online English dub Sakura, Syaoran, and the Invisible Thread, Sakura begins to wonder if the bizarre goings on are connected to Clow Reed’s presence, though she is aware that Clow is long deceased. At recess, Rika shows everyone a teddy bear she made. Sakura decides to get her own teddy-bear-making kit at the craft store where she sees Eriol buying several spools of string. That night, Sakura and Kero once again sense Clow Reed’s presence and meet up with Syaoran and Tomoyo. However, Syaoran’s body begins moving against his will and attacks Sakura. Fortunately, he is able to cast a water spell around himself, revealing a set of invisible strings controlling his movements, which Sakura cuts with the transformed Sword card. Meanwhile, it is revealed that Eriol was the one manipulating Syaoran and that he is the reincarnation of Clow Reed. He has two servants: Spinel Sun, a beast similar to Kerberos, and Ruby Moon, the true form of Nakuru.